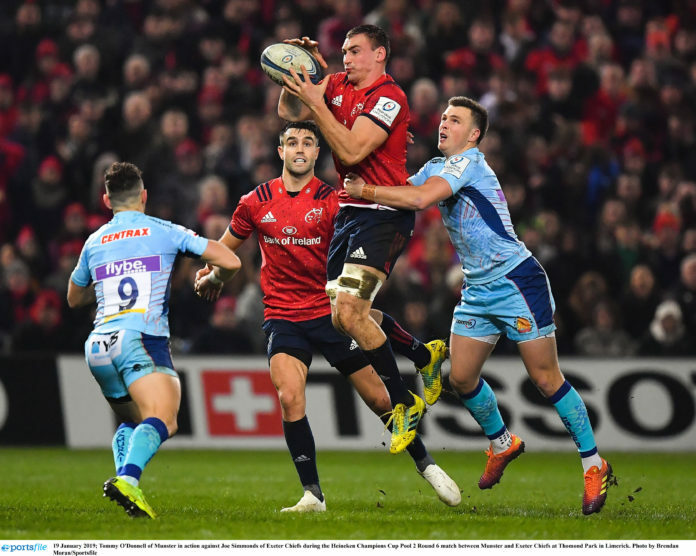 Munster back row Tommy O’Donnell could be on the sidelines for another prolonged period after he sustained a shoulder injury against Exeter Chiefs on Saturday. O’Donnell was withdrawn from the action at half time and Munster confirmed that the openside flanker had been assessed by the medical department on the left shoulder problem and that he awaits specialist review for further management. The province also revealed that nine players have gone to Portugal to take part in Ireland’s training camp ahead of the Six Nations. Peter O’Mahony, CJ Stander, Dave Kilcoyne, Niall Scannell, John Ryan, Conor Murray, Joey Carbery, Chris Farrell and Keith Earls all boarded the plane but Andrew Conway and Tadhg Beirne remain in Ireland due to injuries. Munster also provided an update on long term injuries with Brian Scott (foot), James Cronin (leg), Jack O’Donoghue (knee), Dave O’Callaghan (foot) and JJ Hanrahan (hip) all progressing with rehabilitation. The post O’Donnell waiting to determine extent of shoulder injury appeared first on Sporting Limerick.